DO NOT GO TO THIS DOCTOR FOR ANY NOSE ISSUES YOU MAY HAVE!!! I went to this doctor last year becausefor years I have been having trouble breathing from my nose and getting multiple sinus infections every year. I explained this to the dr. When I saw Dr. Meslemani he put the little camera up my nose to check it out and told me I had NOTHING wrong aside from a sinus infection so he prescribed me antibiotics and sent me on my way. A year later, I went to see another ENT, Dr Michael Cohen in Syosset, who was absolutely incredible! He mentioned it is very dangerous to have as many sinus infections as I have and sent me for a CT scan and bloodwork immediately. He also did the same thing as Dr. Meslemani, stuck the camera up my nose, and immediately noticed a very bad deviated septum along with a sinus infection that he said I must have had for years and immediately recommended surgery or it was possible that the infection could have spread to my brain and I could have been hospitalized! I DO NOT recommend Dr. Meslemani! If you are looking for a great ENT I would definitely recommend Dr. Michael Cohen! DO NOT GO TO THIS DOCTOR FOR ANY NOSE ISSUES YOU MAY HAVE!!! I went to this doctor last year because for years I have been having trouble breathing from mynose and getting multiple sinus infections every year. I explained this to the dr. When I saw Dr. Meslemani he put the little camera up my nose to check it out and told me I had NOTHING wrong aside from a sinus infection so he prescribed me antibiotics and sent me on my way. A year later, I went to see another ENT, Dr Michael Cohen in Syosset, who was absolutely incredible! He mentioned it is very dangerous to have as many sinus infections as I have and sent me for a CT scan and bloodwork immediately. He also did the same thing as Dr. Meslemani, stuck the camera up my nose, and immediately noticed a very bad deviated septum along with a sinus infection that he said I must have had for years and immediately recommended surgery or it was possible that the infection could have spread to my brain and I could have been hospitalized! I DO NOT recommend Dr. Meslemani! If you are looking for a great ENT I would definitely recommend Dr. Michael Cohen! Dr. Meslemani was very personable and through. The office was staff were very helpful and very nice to deal with. Iwould highly recommend Dr. Meslemani. PLEASE NOTE: Our Deer Park location is not handicap accessible. We apologize for any inconveniences this may cause! Dr. Meslemani graduated 2006 from Wayne State University. He is affiliated with many hospitals including Franklin Hospital, Mount Sinai Queens, New York Hospital Medical Ctr, North Shore University Hospital. 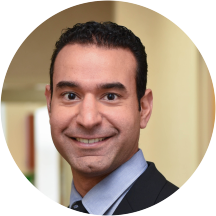 Dr. Meslemani is fluent in English, Spanish and Arabic. He and his friendly staff are excited to welcome new patients! If you're looking for quality care in a safe and warm environment this is the office to visit! Very personable and patient. Answered all of my questions thoroughly. He was great! Listened to my concerns and was very respectful. I wish more doctors were like him. The wait time was unbearable. We were in the waiting room from 4:40pm to 6:00pm and the another 15 minutes in the actual patient room. The doctor was very positive and educated. He spoke well and explained things to my 10year old. He offered some samples to try . We were in and out in 15 minutes. I guess it was worth the wait. The doctor is wonderful! Thorough and has a wonderful bedside manner. Waited over an hour to be seen. Was treated like I was wasting his time. Extremely rude and arrogant. He made comments about how terrible my insurance was even though that was clearly all I could afford. Rushed and wasn’t listening to my concerns. He listened, entered notes, verified with video, and offered both immediate treatment with OTC medications as well as potential alternative, holistic options should I prefer to go that route. Have follow up in 2 weeks and will know by then if what was offered is effective. Gave me a diagnosis after going to numerous ENTS. When I arrived at the office, I was asked to provide my social security number, but I declined as I have experience working in doctors office and I know that SS#s aren’t required. I was then informed that this was thepractice’ policy, and if I did not provide my SS#, then the doctor would not see me. I know that this isn’t a lawful practice. I stayed and saw the doctor. My experience with the doctor and his assistant was completely different from that with the front office staff. The doctor was very respectful. He took his time explaining what he would do and what to expect. He did some blood work and asked me to follow up with him to make sure that the issue I saw him for in the first place was gone. I would definitly recommend this doctor to my friends and family. Very good like always, Dr. Meslemani is a great Doctor, he takes your concerns seriously, and he makes sure he find the appropriate treatment for you. Dr Meslemani is an excellent ENT. I've seen him many times in the past. Highly recommended! He's really a great doctor. Very helpful towards his patients. Dr. Meslemani was very likable and always listened. I did not feel rushed like a lot of doctors do these days. Aside from the wait in the waiting room, I highly recommend this Doctor! Thorough and patient with my 2.5 year old, once he came in and examined my child he had the "nurse" come in and run a quick test and I waited no more than 5 minutes for him to return and explainresults to me and offer a diagnosis and request that I return to see if the medication was working. THE VISIT WENT VERY WELL.THE STAFF WAS GREAT,THE DR. WAS AWSOME.WE REALLY LIKED HIM. he is the best ENT. Great person. Highly recommended. Wonderful office staff, excellent Doctor!! So glad I found them on ZocDoc. He very professional and knowledgeable. Dr Danny is great, explains everything very well, also very helpful with the paperwork and phone calls to your employer, lots of Dr's are to busy for the paperwork to be filled out. he was great. after getting the run around from three other doctors when i told him what the problem was he just said no problem we can fix this. thank god for a caring doctor. Very professional and good bedside manner. Office personnel were great also. Dr Meslemani checked my ears, throat and nose. He explained what he is doing and did some test he ordered. Then afterwards explained my results. I felt better and good when I left the office. Dr, Meslemani was very pleasant & informative. I was very confident in his ability to put my mind at ease. Very thorough, kind and knowledgeable doctor. Would definitely recommend. Compassionate, friendly, professional efficient. An overall positive experience . He is a great doctor! He has a great personality. He explains everything that he is doing . I am very fearful of ear doctors but he made me feel so at ease. He was very gentile with me. Very nice doctor. Very informative. I like how the Dr Meslemani was friendly and attended to my son timely.